Adobe Systems Inc. has given Photoshop an upgrade, adding a 3D printing feature to the growing list of things users can do with it. 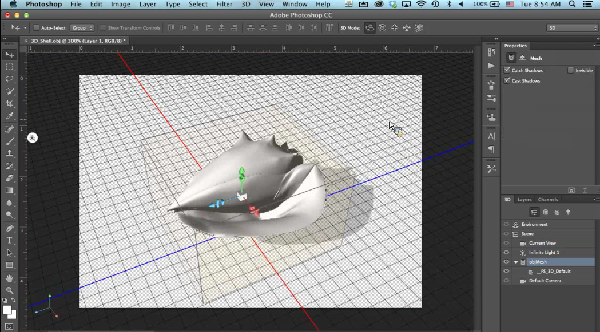 In a virtual briefing this week, Adobe unveiled its newest tool for its popular graphics editing software, demonstrating how design professionals can use it to tweak their 3D printing models. Essentially, the tool gives users the ability to add colour to their models, as well as to take their prints and check for any flaws – for example, a hole in the mesh of the 3D print, or a print with walls that are too thin for a 3D printer – and ensure they don’t print them out, scrap them, and then have to try printing them again. (Image: Adobe). 3D model of a conch shell. With this new update, Adobe is not trying to replace the 3D printing programs that are already out there, like Makerbot and Shapeways, says Andy Lauta, product manager for Adobe Photoshop. In fact, Adobe has partnered with both of the companies behind those programs, he adds, and Photoshop is now compatible with five file formats: OBJ, STL, 3DS, COLLADA, and KMZ. 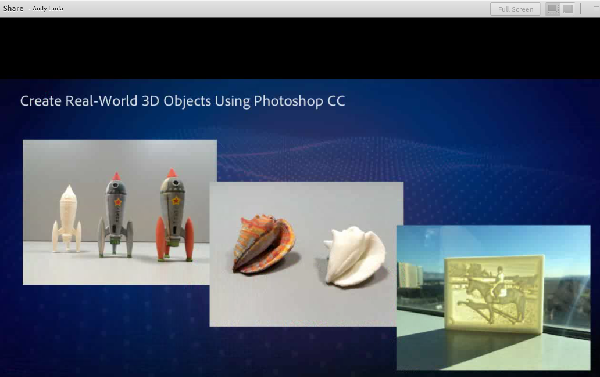 During the press briefing, he demonstrated what editing a 3D print of a conch shell might look like. Using Photoshop, he added colour to the shell and then showed how Photoshop can add scaffolding and support structures to show the dimensions of the 3D print. The main goal of Photoshop’s 3D printing tool would be to cut back on some of the complexities in 3D printing, Lauta says. While many creative professionals want to be able to print prototypes of their work, the problem is there are so many types of technologies, many of which require some level of technical knowledge. And then of course, the 3D printing process itself can be complicated. While Makerbot and Shapeways are very popular, their programs don’t allow users to check for gaps in the mesh of their 3D models, which are supposed to be seamless when they print. Otherwise, users would end up with models with holes in them. (Image: Adobe). 3D prints finished with Adobe Photoshop. “There’s an inherent complexity associated with translating what you see on your screen in a modeling tool to an actual material that’s being produced on a print bed. Just like in 2D printing, someone needed to figure out how to take pixels on a screen and turn them into ink that’s placed on paper. It sounds really trivial – it’s actually a very, very complicated problem,” Lauta says. He envisions jewellery designers, animated filmmakers, and sculptors using the program to make small models and rough drafts of their work before actually starting on the life-sized versions of their projects. In addition to announcing its new 3D printing tool, Adobe also released some upgrades to its programs, like the Typekit feature in Illustrator. Designers will now be able to easily add fonts and find them in a library. Spokespeople demonstrated the Perspective Warp tool, which allows users to easily twist the dimensions of a layered image in Photoshop so it will not look out of place when layered with another image. There is also the new Live Corners tool, which makes it easy for users to make curves and control them by clicking and moving a mouse. (Image: Adobe). The Perspective Warp tool in Photoshop. And for InDesign, editors creating digital publications can now ensure their content will work across devices, not just on a desktop screen. In the past, users looking at some of the graphics in InDesign would have problems with static sizes, but now InDesign supports scalable vector graphics (SVGs) that allow for automatic scrolling, as well as responsive web design. All a content creator needs to do is check off a box in the “options” area when saving an SVG. 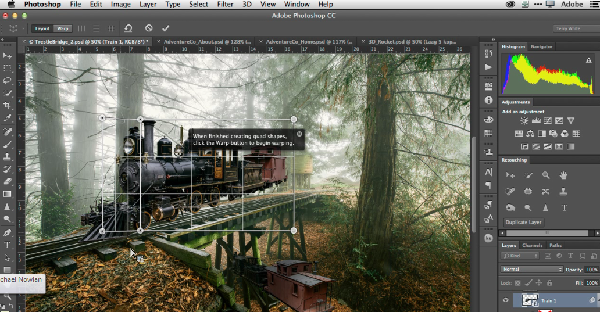 All of Adobe’s upgrades are free for subscribers to its programs. The company also has a free 30-day trial for new users looking to give the new features a test drive.